For Sale- -- Click on Any Picture to Enlarge! 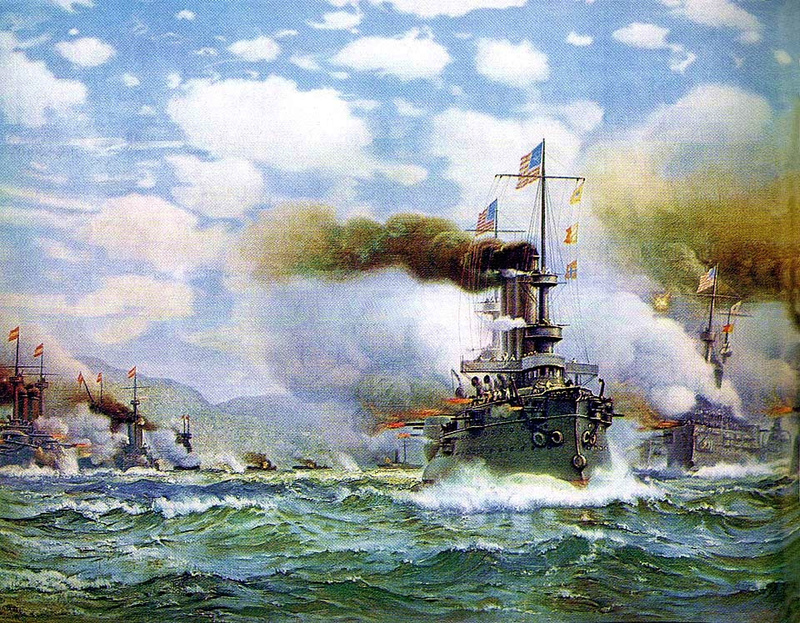 After shakedown off the Atlantic Coast, Iowa was assigned to the Atlantic Fleet and was ordered to blockade duty, 28 May 1898, off Santiago de Cuba. On 3 July 1898, she was the first to sight the Spanish ships approaching and fired the first shot in the Battle of Santiago de Cuba. In a 20-minute battle with Spanish cruisers Maria Teresa (flagship) and Oquendo, her effective fire set both ships aflame and drove them on the beach. Iowa, continuing the battle in company with converted yacht Gloucester sank the Spanish destroyer Pluton and so damaged destroyer Furor that she ran upon the rocks. Iowa then turned her attention to the Spanish cruiser Viscaya which she pursued until Viscaya ran aground. Upon the conclusion of the battle, Iowa received on board Spanish Admiral Cervera and the officers and crews of the Viscaya, Furor and Pluton. The year 1898 saw the 24th Infantry deployed to Cuba. They participated in the storming of the Spanish fortress in the Battle of El Caney. At the climactic Battle of San Juan Hill, units of the 24th Infantry assaulted and seized the Spanish-held blockhouse and trench system atop San Juan Hill. The 25th participated in the 1 July 1898 assault on El Caney. Men from the 25th were among the first to reach the summit. Private T.C. Butler of H Company was first into the blockhouse at the summit, capturing the Spanish flag. SA-300 Original 1930s Navy Expeditionary Medal Ribbon, old stock. $15 for a 1 foot length. SA-299 Original 1920-30s China Campaign Medal Ribbon, old stock. $15 for a 6 inch length.